What Obama, Clinton group really want? This post is not closely related to the nature and this is a special one. Subject to this post is a cursed movement of Obama, Clinton group against Sri Lanka and native people of the country. They tried to show their false humanity again by leveling false allegations against Sri Lanka security forces about violating human rights. The reason behind this is not the humanity, justice or any kind of a goodness of Obama Clinton group. Primary object of their cursed movement is destroying the Sinhala Buddhist nationality which is native to our country. Why? Because of we are thinking in our way. Western politicians who are following liberal democracy are also following imperialism as well even they are liberal democrats. They want their followers to be leaders of all countries from all over the world. In this case, first the British politicians wanted LTTE to attack and destroy native people of our country as much as possible. And they wanted to treat their south Indian workers by politically dividing the country and preparing Tamils to rule north and east of Sri Lanka. It is the truth here and that is how LTTE was begun. Tamil politicians and their supporting British politicians were annoyed native Sihala population continuously. They never thought of protecting the human rights of native Sinhalese. Native people have no human rights. Why? Native thinkers of any country have no human rights. Because of they are not accepting western ideologies and Jewish way of thinking. Obama, Clinton group is following western post modernism and liberal democracy which are based on Jewish way of thinking. The basis of human rights is Jewish way of thinking as well. Western ideologies are usually protecting western followers in anywhere. The concept of human rights doesn’t want to protect native people of any country who are not following the west. That is why the concept of human rights did not act when the native people of Sri Lanka become victims of LTTE terrorist attacks in the past. But the same human rights concept is protecting the LTTE even today. Why? Because of the roots of LTTE is closely related to British imperialism and the LTTE followed western ideologies. In other words LTTE represented the west ideologically. The term of “human rights” is totally corrupted and very abusive. The most interesting thing in here is the double standard of Obama, Clinton group when it comes to the problem of terrorism. 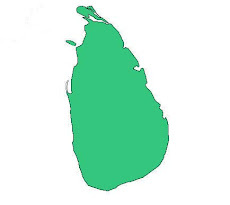 These people are generalizing their military actions against the terrorist group of Alquaida, but they do not like to accept the military action which has taken by the Sri Lankan government against LTTE. And they are talking about the human rights of terrorists. Finally western double standards, corruptions and all kinds of fallacies including false human rights came out in Geneva. The real expectation of western political authority which is following Jewish ideologies is destroying the nationality of Sri Lanka and secures their followers. The final target of people like Obama and Hilary Clinton is executing their ideological invasion in south Asia and gradually destroying all the cultures which are not being consistent with western Jewish way of thinking. As I mentioned initially, this post is not closely related to the nature, but there is something special to tell. That is Jewish ideologies are not nature friendly. That is why people who are following Jewish ideologies disfavor the people who like to live close to the nature. Native people of countries like Sri Lanka usually like to live close to the nature and think close to the nature as well. That is why we are not following western modernism and false development theories blindly. As we know feminists do not like to be feminine and they do not accept feminine gender specifications of female community. Feminism does not teach women to be feminine. Why? Because of femininity is corresponding to masculinity and being feminine is equal to being consistent with male sexuality. Feminists know that men like feminine women, because of male sexual preferences. Feminists usually refuse male sexual preferences and they hate male sexuality. This mindset of feminists is the basis of feminism theories. Most of feminists are not sensitive to understand even their own sexuality and the feminine gender specifications which are based on female sexuality. Actually feminists do not like to act as women with the feminine gender identity. Some of them want to follow a masculine way of life and some of them want to make a gender neutral social situation. But any one of them does not want to build up a female community with the feminine gender identity. Because of their anti male mindset does not allow them to be feminine and to be consistent with the male sexuality. Feminists like to oppress feminine women as well. They hate feminine women and the feminine gender identity too. Actually they need the female community only for talking about false discrimination and create fake women’s issues for their advantage. Physical fitness and health is heavily depending on the status of mind. Mental health is very important for the body health. Stress free mind helps to keep the blood circulation properly. Proper blood circulation is important for every organ to function properly. Mind is controlling the functions of central nerves system directly. Functions of the central nerves system are controlling every part of the body and they are controlling some of endocrine functions indirectly as well. Other most important thing for the body health is food digestion. Stress free mind is greatly enhancing the function of food digesting and the absorbing of nutrients. On the other hand mental stress is an obstruction for the nutrient absorbing. These facts can prove the importance of stress free mind for the body health well.